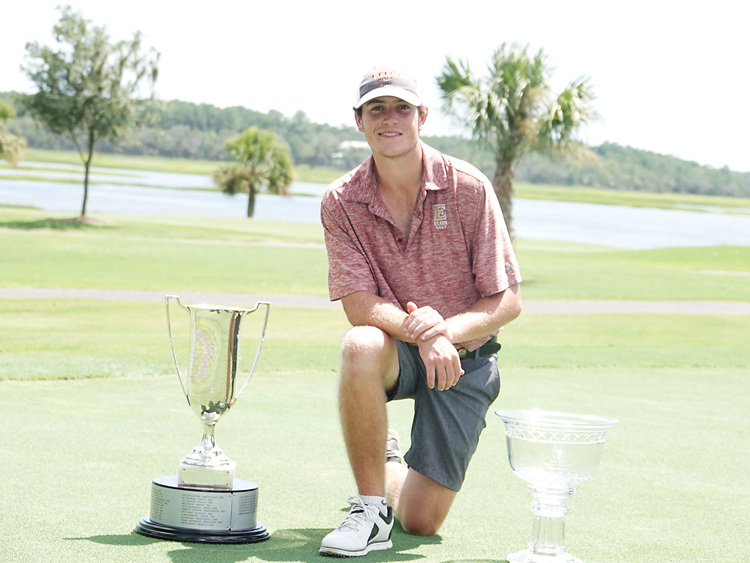 William Harwood held or shared the lead for the entire final round of the SCGA Amateur at the Dataw Island Club. 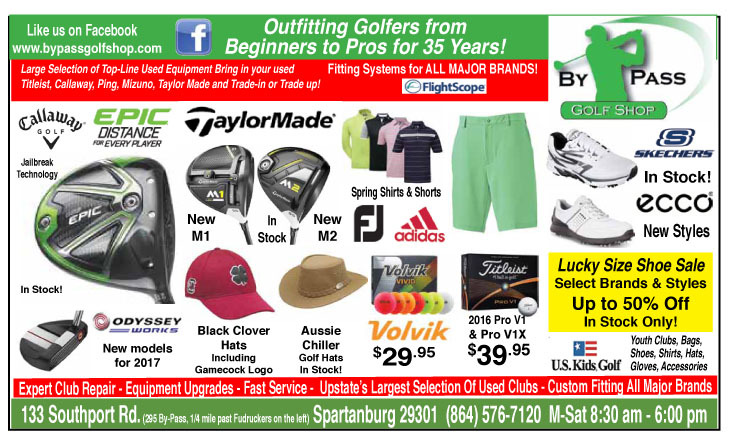 The final round of the South Carolina amateur could have been a lopsided win for William Harwood, but instead it turned into a nail-bitter as Sawyer Mills challenged the tournament leader right up to the final putt. Harwood started the final round at the Dataw Island Club 4 shots up on the Winthrop University golfer. The rising senior from Easley started cutting into Harwood’s lead on the very first hole with a birdie. “I got off to a good start with a birdie on the first hole,” said Mills. 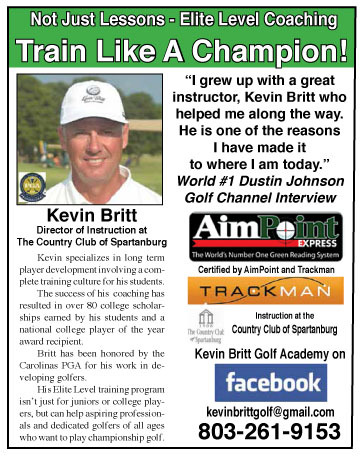 I gave it back with a bogey, but I felt confident I could chase him down,” he said. Mills kept chipping away at Harwood’s lead. The Elon golfer played the first nine holes at even par marking the first time in the tournament he was not under par on the front. “I knew going into the final round that Sawyer was going to make a run at me,” said Harwood. “I wasn’t playing as well as I wanted to, but even though I was not swinging great I stayed strong through that stretch,” he said. Sawyer Mills made up four shots before a late round bogey dropped him into second place. After the 12th hole, the three shot difference in favor of Harwood was gone. Mills started the final nine holes with three birdies in the first four holes while Harwood played the same holes at even par. “I didn’t realize I had caught him. I was just trying to play my own game and not worried about the gap between us,” said Mills. Once the two leaders were tied it turned the final six holes into a head to head showdown as no one else in the field was able to make a charge. “It was like match play towards the end. I would say to myself that Sawyer was going to make a putt and most times he did. All credit to him he played great,” said Harwood. Both golfers birdied the 13th hole, but on number 14 the tie was broken when Mills could not convert his par. The bogey gave Harwood a one shot lead. “I missed a little short one. I played well, but I did let a couple get away from me,” Mills said. 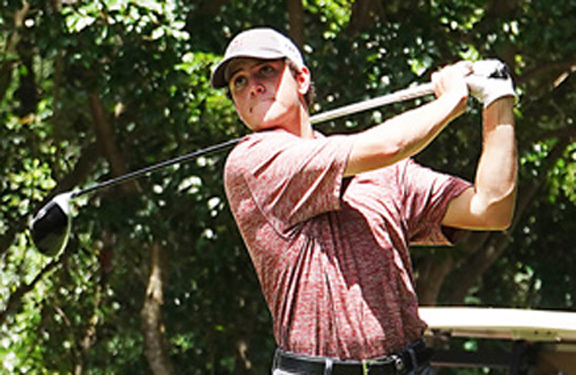 FSU golfer Jake Carter from Aiken finished with a 4-under par 67 for third place. On the 15th hole Mills had a 12 footer for birdie to even the score again. However, Harwood ran in his birdie putt from about 35 feet to maintain his one shot lead. “When I made that long one on 15 it felt great because I had come up short on a few other putts. I was pleased to have made a birdie on a hole that wasn’t a par-5,” he said. Each golfer flirted with giving up the lead later in the round. Harwood needed a sand save on the 17th hole to hold his lead. Mills came within a fraction of an inch on the final hole when his 25 foot birdie putt just missed the lip ending his chance to force a tie and a playoff. “I felt confident that I could catch him when we started. Once I caught him I just couldn’t get it done. I played well and did my best,” said the runner-up from Easley. Harwood rolled in his last four footer for the win. As the putt fell in the hole the winner let out a loud yell showing some of the emotions he had kept bottled up all week as he began to celebrate his biggest win. “I feel like I am a big time competitor. When the moment comes and the crowd is around and you have to hit the shot and execute, I feel comfortable in that position,” said the 2018 champion. Mills was disappointed with the result, but was pleased with the effort that let him make up a four-stroke deficit in the final round and get in position for the win. “I’m excited to play good again. I have not played well in a while so it is good to get things going as I get ready to go back to school and have a good senior year. Harwood finished the championship shooting rounds of 66-66-66-70 for a 268 total. Mills carded rounds of 68-66-68-67 for a 269 total. First round leader Jake Carter had fallen back after the third round. He matched Mills final round 67 to help the Florida State golfer from Aiken hold on to third place at 10-under par 274. 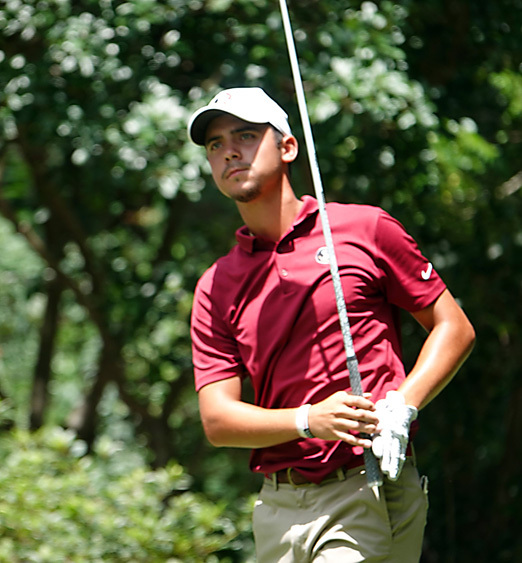 USC golfer Caleb Proveaux shot a final round 2-under par 69 to take fourth place at 7-under 277. 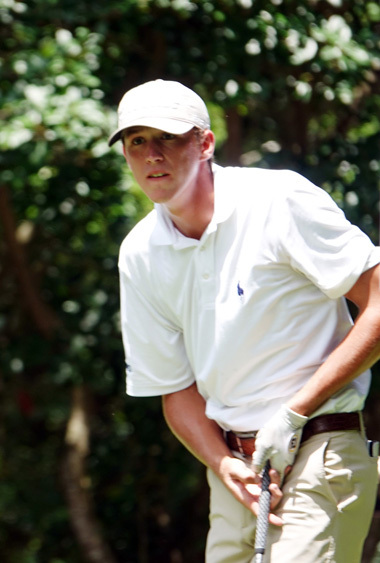 Former Wofford golfer Jeremy Grab and NC State golfer Christian Salzar tied for fifth place at 4-under par 280. Harwood had a solid sophomore year playing for the Pheonix last season and believes his success in the state championship will help jump-start his year at Elon. William Harwood wins the Billy C Lewis Trophy as the 2018 SCGA Amateur champion. “My summer didn’t start off the way I had hoped, but getting a win here is a great way to go back to school and start the new season,” concluded Harwood. The unsung heroes of the championship were the grounds crew at the Cotton Dyke course. The crew kept the course playable after almost 6 inches of rain fell the first two days. Thursday’s round had to be completed on Friday morning because of heavy rain. 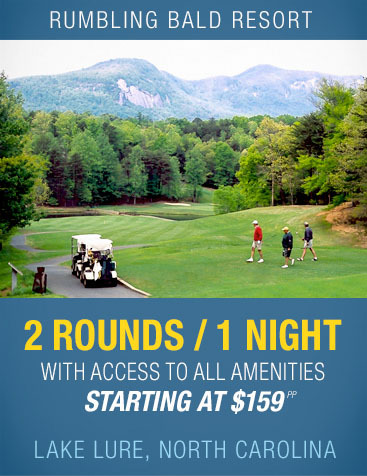 The second round also was extended into Saturday because of more rain. When the field began play in the final round on Sunday the course was back in such good condition that the golfers played the ball down. “All the golfers and I are so grateful to the crew here at Dataw,” said Biff Lathrop, the Executive Director of the SCGA. “The crew was here dealing with the rain and had the course not only playable, but in great condition,” he said. The top-20 golfers will not have to qualify for the 2019 SCGA Amateur to be played at Thornblade Club in the Upstate. Golfers with scores of 289 or better are exempt into next year’s championship.